One of the pleasures of running CycleVentoux here in the south of France is the incredible array of great ingredients to cook with in the markets. Whether it is Tuesday market in our neighboring Vaison la Romaine or our three great supermarkets: Super U, InterMarché or, dare I say Lidl, the cost-conscious supermarket that was voted “best quality” last year by an influential French foodie publication. My posh neighbors smile at me brandishing my Lidl shopping bag— “wouldn’t be seen in there, but you can get away with it being an American.” Ahhh, the social class system still fully in effect. A favorite dinner of cyclist/guests after a day on the road is simple—roast duck breast over white beans with onion, sage, and rosemary accompanied with fresh escarole braised in olive oil, white wine, garlic, and herbes de provence—the bottle of local côtes du rhônes goes without saying! I arrived in Séguret after skiing in Chamonix for a week with CycleVentoux riders Melody Badgett and Jen Bennett from last summer. The drive south through the pre-Alps was beautiful—wild weather through Grenoble and the Chartreuse mountain range. Crossed into the Rhône valley to a stunning sunset. Spent the evening making beds and cooking a classic Provençal daube (beef stew) for arriving clients, a group of six guys from NYC. They have been riding in their gym spinning classes in anticipation of their trip here. 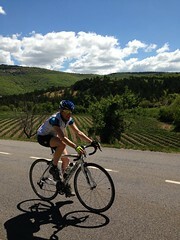 We rode the Gorge de la Nesque route from the house that circumnavigates the Mont Ventoux massif. We all agreed it was so fine to be back on the bike after a long northeast winter. All home now to a glass of Cote du Rhône, dinner, and comfortable beds in anticipation of a long day riding to the Med—perhaps a swim in the ocean before the van ride home. Bouillabaisse sounds like a good dinner plan after that! Early October With the first snows begining to fall in the Alps we made a last tour of the classic cols for this season. We were greeted by a dinner of raclette and comfortable beds at the Chalet d’Augustine on the Col de la Madeleine road just above the town of La Chambre in the Arc river valley. Our goal was to climb the Glandon and Croix de Fer the next day and make a circuit back to La Chambre – 43 miles. We awoke to a great breakfast of local cheese & charcuterie, yogurt and plenty of good coffee. We suited up and drove down to La Chambre to park and launch from there. We crossed out of town, over the Arc, the autoroute and rail lines heading to the Fréjus tunnel and Italy. The climb begins shortly once out of town and wends up on great road surface, small farms and pastureland. At about mile ten it opens up to high pasture land and the final switchbacks to the Col du Glandon. We were met by snowflakes in the air and a desire to get over the Croix de Fer (two miles on) and down to the valley so we could generate some warmth by pedalling. We rounded a bend, and a charming sheperdess (bergère en français) in her ski parka was bouncing up and down to stay warm, while her collie was making sure the sheep stayed in line. She laughed at the site of us, and said there was a cafe a few miles down that was open. We made a beeline for it to warm up over a double espresso. We descended in rain and were very pleased to get back to the Augustine for a cold beer and raclette warmed via a hardwood charcoal brazier device – very cool, and delicious! Plan your Spring/Summer ’12 Trip with us soon! Contact us to plan a cycling trip during our upcoming season. Our email is robert@cycleventoux.com or call (802) 291-0415 to discuss a custom trip beginning and ending at the house in Provence and visiting the classic cols of the Alps or Pyrenees during the week. $2,800 for seven days and six nights. Carbon fiber bike and all meals included. Saturday morning dawned broody and cold with a broken sky, but as weather has been cooling dramatically here in the south of France, the opportunity for a final ride on Mont Ventoux can’t be passed up. We head out early for a café au lait and croissant at a local bar in Vaison and catch the rising sun in a small square in the old roman quarter. The ride warms as we bump into locals we know on their weekend ascent – lots of banter, we rarely see a car. An hour later after a great pace, we break out of the forest and see the parking lot of the Chateau Reynard packed with end of season car and motorcycling enthusiasts from Germany and Holland soaking up the waning Provençal sun. We debate stopping for lunch, but agree that heading home for a warm bath and communal risotto is the plan. As we climb up through the open scree slopes, we remark that the black and yellow striped snow poles have been installed. We pass a turnout where Saturday downhill mountain bikers (VTT here – velo tout terrain) have gathered to ride up on the J bar lift that has been opened for the day. We are cheered on – Allez, allez! The summit is quiet, except for some bundled sightseers. We quickly suit up for the 45 minute descent to Malaucène and the waiting van. A quick hello to our bike shop friends who will be soon closing for the season, then home to light the fire with dried vine limbs from last year’s vineyard pruning. A fine way to end the ’11 Fall season. We laugh and try to imagine the first climb next Spring and trying to keep in condition over the winter ahead. After a few days in Séguret riding beautiful roads and a warm up climb of Mont Ventoux, we headed three hours north to the central Alps, home of some of the most famous (infamous!) climbs of the Tour: Galibier, Glandon, Télégraphe, Croix de Fer and Alpe d’Huez. Six stunning days of quintessential Fall weather, no car traffic and hundreds of kilometers of smooth road surface. Our longest day had us making a loop from our home base in Mizoën (on the road to the col du Lauteret and high above the bustle of Bourg d’Oisans) down to pick up the D526 and begin the climb to the Col de la Croix de Fer. The valley tightens after a hydroelectric lake and wends it’s way through steep rock slide and forested landscape. The road has seen much new pavement recently. Past the village of Le Rivier it opens up into wide open alpage with towering crags overlooking the lake of the Grand Maison – brilliant aqua blue. The hillsides are dotted with herds of sheep and cattle bleating and neck bells ringing getting in the last high alpine grass before the snow flies. A few more kilometers of 6% grade had us over the Col and a 45 minute descent through small alpine towns renowned for their Beaufort and Gruyère cheeses. 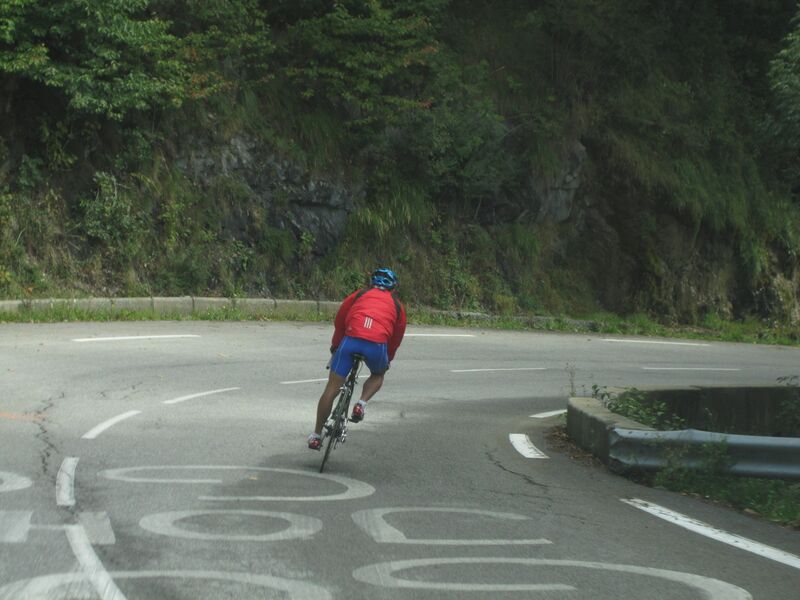 Once in the Arc river valley it is a twenty minute ride to pick up the Col du Télégraphe. The climb spends most of it’s length winding through alpine forest in the shade. At the bends there is time for stunning views of the valley below and the road that links this part of France with Italy through the Fréjus tunnel. Views across to the peaks of the Vanoise National Park and it’s glaciers are breathtaking (not that you’ve got any left to spare). We take a food and water break in the ski station town of Valloire before the final climb of the day – the Col du Galibier. A hot bath and great savoyard food awaits us back home in Mizoën. 102 Miles/13,773 feet in elevation gain – A great day!